Prevents sliding in your seat, increasing driver performance - even through the most demanding cornering, braking and terrain-dictated maneuvers. 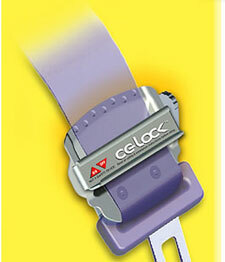 Eliminates the need to "hang on" or "brace" yourself, keeping hands and feet dedicated to driving. As a result, fatigue and distractions are reduced, vehicle feedback increased, and reaction time dramatically improved - all resulting in faster course times. After a price of only $48.95 and a 30-second installation, the CG-Lock delivers about 80% of a full racing harness's "holding power" while leaving your arms and upper body unrestrained for maximum movement. The CG-Lock is not a safety device and is not intended to encourage or compensate for reckless, illegal or inappropriate driving. Read all safety information before using. The CG-Lock Occupant Stability Equipment are allowed as long as the CG-Lock is installed according to the manufacturer's supplied instructions, the CG-Lock has no effect on the original factory upper body restraint and will be compliant with Sections 3.2.C and 4.10.L of the 2004 CASC-OR Solo 2 Rule book. This includes convertibles without roll bars.